China stand proudly as one of the world’s biggest superpowers, so its only appropriate that their capital should boast the development, history and culture that has made this nation great. A unique nation which stands alone with its incredibly powerful and influential culture that has seeped into every corner of the Earth. There is no greater overall representation of this amazing country than its equally magnificent capital of Beijing. As travelling is concerned, Beijing would have to be considered one of the best possible cities to explore. The number of sites and opportunities to delve into a complete unfamiliar culture is abundant. All of which are scattered in-between the snug blanket of concrete development. China has realised the potential in tourist dollars as well as the local Beijingers knowing how to relax and take advantage of big city life. First off, you must get to grips with the gargantuan size of Beijing. Its easy to forget that the city is home to more than 24 million people (more than the entire population of Australia). This extraordinary number of people are jammed into an area not much bigger than Singapore or Jamaica. Such size should exacerbate the common problem with big cities; travelling from A to B within the city can eat up a lot of time. 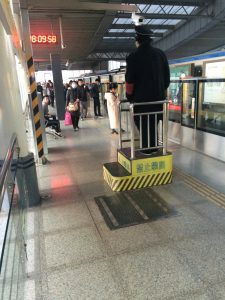 However Beijing’s extensive transport system has attempted to make it as easy as possible to travel anywhere within the city. Beijing itself is enormous, and the city outstretches far and wide out of the city centre. The city has been helpfully divided into separate districts, each with their own unique flavour and identity. Each district will have something to appeal to travellers and expats of all mind-sets that find themselves in Beijing. The heart of the city is split into two separate districts; Dongcheng and Xicheng (East City and West City respectfully). These two are considered the main area’s of the city which holds the best historical and cultural sites. Dongcheng arguably would be the most important district for travellers, as its where you’ll find the best representation of Beijing’s extraordinary past and incredible culture with the best historical and sites of significance in the city nestled closely together. The highlights would include Tiananmen Square, the Forbidden City AND the Lama Temple. Here you’ll also find the infamous bug market in Wangfujing. This rich area also holds the arrow straight tourist packed shopping street of Nanluoguxian, cutting a bright light through the network of hutongs. Xicheng boasts a more natural influence as the city’s concrete curtain is broken by a series of lakes and parks that wind their way through the city. Some beautiful examples can be found around Shichahai, with one of the best being Beihai Park which towers across the district. The eloquent banks of these lakes are lined with endless rows of restaurants, bars and cafes. No other lake looks more beautiful at night than the lakes of Houhai, making this district one of the most attractive. This district also holds the best examples of the authentic traditional hutongs which defines local life with their winding hedge-mazes between the busy Beijing streets. Some might regard the Eastern district of Chaoyang to be the true heart of the city. 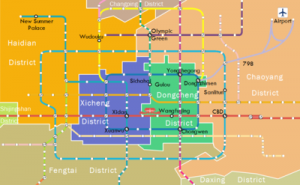 This district would have to be considered the most cosmopolitan district within Beijing. As this lone district has a higher population than the entire nation of Wales, its easy to see why such a high rate of foreigners find themselves along these streets. This would also be regarded as Beijing diplomatic area, as practically every foreign embassy is found here. There are also numerous amounts of international companies that set up camp here, and with that comes the influx of international schools, Western restaurants/bars and monumental malls. The best example of this is found in the streets of Sanlitun, which would has to be considered Beijing’s party central. This district is so vast it actually incorporates Beijing Capital Airport and the 798 Art District. 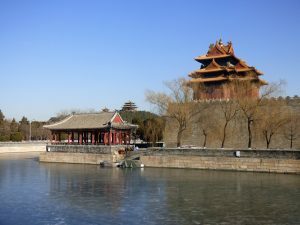 Beijing must be considered as one of the best cities worldwide for sight-seeing opportunities, with an astonishing 7 UNESCO heritage sites JUST in Beijing. The number of sites and attractions worth seeing is practically endless. Much like the ancient streets of Rome, the extensive history and culture of China’s past is snuggly nestled amongst the claustrophobic madness of its developing skyline. The city and its surroundings hold some of the world’s great historical sites, all within easy reach. For travellers on a time-limit, the city centre provides multiple treats to tick off Beijing’s top highlights list in quick succession. 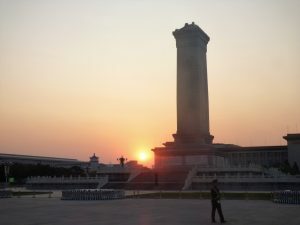 Here you’ll stand in the infamous Tiananmen Square which is surrounded at all 4 sides by sites worth a look. 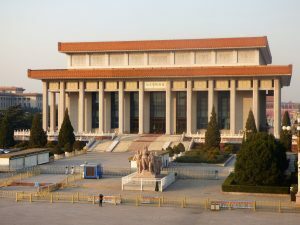 These include the National Museum of China and the Great Hall of the People on either side. Within the square itself you’ll find the mighty mausoleum of Mao Zedong. Towards the South of the square you’ll find the authentically restored (although some debate how authentic) beautifully designed Qing dynasty streets of Qianmen, famous for its sightseeing and shopping alike. In between the street and Tiananmen square you’ll find the mighty overshadowing Archery Guard tower. To the North of the square you’ll be faced with a national symbol the vast Gate of Heavenly Peace. Easily recognised with its enormous portrait of Mao Zedong, its the very same wall that the People’s Republic of China was born. The gate along with Mao so eloquently guard the grounds of the Forbidden City behind. Throughout the city you’ll find treats randomly dotted amongst the streets, which can easily be missed within the claustrophobic maze of Beijing. 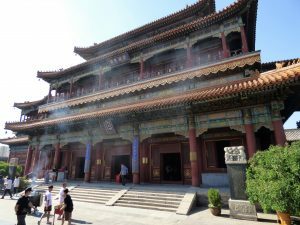 One site which shouldn’t be missed is the Yonghegong Lama Temple; much the peaceful spiritual oasis in the chaos that is Beijing. This is also a sight of significance as its the biggest and most perfectly preserved Lamarasy in all of China. 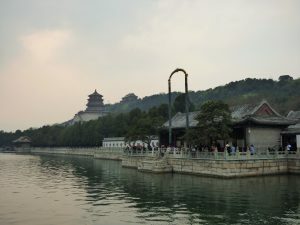 Others include the best preserved park formally the home of royalty in all of China; the Summer Palace, where the high class used to relax and play. On the opposite end of the city you’ll also find the equally exquisite grounds of the Temple of Heaven. Here you’ll be able to visit one of the most notable attractions in all of Beijing. As the sun sets, the city provides even more dramatic displays. These would include the beautiful twinkling lights of Houhai‘s banks against the slow rippling lake. Another site worth a look would be the Olympic Village in all its glory. 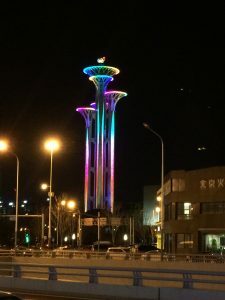 Here you’ll find the infamous birds nest and spectacular multi-coloured Olympic Tower all lit-up. Not to forget Beijing’s outstretching grasp outside of the city limits. 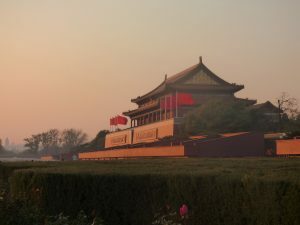 Beijing’s burrows holds a breadth of opportunities for travellers and some of the most notable sites in all of China. The most famous of which would be one of the great wonders of the world which sits just a stones throw away (or a subway and bus) from the city centre. A similar distance from the city you’ll be able to visit another world famous site; the Ming Tombs. Just like anywhere else in the world, a good rule of thumb will always be to use taxis…only as a last resort. With no exception they are the most expensive way of travelling within a city. That’s only where the problems start with Beijing’s cabs. Spotted by their yellow and various coloured roofs, there are plenty on the roads, but flagging one down is a whole other issue. 8 times out of 10 times, the cabs are already in use, or otherwise on the way to pick up a client. When you’re finally fortunate enough to get one, then it becomes a toss of the coin whether the driver will take you. You’ll regularly get rejected for lack of Chinese (making it too difficult for him to figure out where you want to go) or you’re simply not going in the direction he wants. If you’re lucky enough to overcome all of these hurdles, you’ll still have the luck of the draw on whether you’ll get ripped off. Just be sharp enough to demand the meter before you begin. The one form of transport you’re likely to find in any city running endlessly is the bus. The capital holds an extensive network of buses that run endlessly covering every inch of the city. As is the size of Beijing, by far it makes it the slowest way of getting from A to B, however it’s also the cheapest. Its also important to consider that the entire process will be in Chinese; signs, stop names, bus drivers. There’s no English, making the entire process incredibly difficult. Despite the bus being the slowest and most underused form of transport, its the only public transport that runs throughout the night and the early hours of the morning. Don’t disregard it too soon. 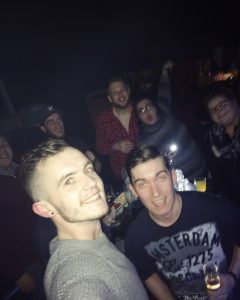 At 3am when you and every single other club goer is trying to grab a taxi, it becomes a lifesaver. It also has the added benefit of being one form of travel you’re able to pay with the multi-purpose travel card. Easily the cheapest, fastest and most efficient form of transport within Beijing and any other city. The extensive spider-web of subway systems are unbelievably reliable. Trains run 5 minutes away from each other at the most, and able to take you to any point from A to B in the city (with a couple of transfers of course). As initially daunting as trying to decipher the criss-cross of 17 potential lines may seem, the display of efficient signs and a bit of familiarity soon makes the whole process a breeze and blessing having a subway. Costing anywhere between 3-9 RMB (around 30p to £1) per journey, its easily the cheapest option. The only negatives will come in the popularity of this transport. Being the popular choice with locals across all social classes, at times the subways can become less than comfortable. Particularly when you’re pressed up-close and personal with Beijing citizens. Equally irritating is the hordes of locals who will block off advancing crowds of subway goers. Mainly by walking at a snails pace with their head buried within their phone, with total disregard for other passengers. The transport is also on a time limit, from 5am to around 11:15pm. Very much the modern option, I give you Chinese Uber. Very much like its Western equivalent, it’s a more efficient and reliable form of taxi. As the Chinese have developed the smartphone as an extension of themselves to this point, its no surprise its a popular choice. A driver one be quickly ordered (or booked) at any time, any location, and soon enough he’ll come to pick you up. This is still an expensive option, being similarly priced as a taxi (if the taxi driver’s honest enough to charge you the proper rate). However this is much more reliable, efficient and available at all hours of the day/night. Being that’s the case, the price will fluctuate given the time and number of drivers available. When there’s a shortage, you’re in for a wait. As is expected with an enormous city, there is a vast supply of accommodation available. There are over 400 individual hotels throughout the city, without to mention the alternative options. 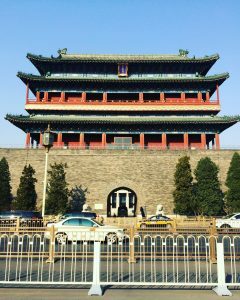 Beijing provides everything from the luxury 5-star hotels to budget hostels and everything in-between. Unfortunately Beijing doesn’t hold many bargain hostels as you might expect. Not quite as expensive as you’ll find in the highly ordered streets of Europe or Australia, but still high by Asian standards. The cheapest you’ll find starts at £10 for dorms all the way to £19. This ensures that a couple of nights stay is more than sufficient. The map below shows all hostel options according to Hostel World. As the map shows, most options will be secluded found in Dongcheng District, mostly around the high-end party central of Sanlitun. Otherwise they are bunched together in the Southern district of Fengtai. 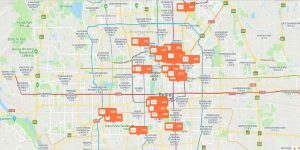 Map of all the hostels in Beijing, courtesy of Hostel World. For once it might not even be too ridiculous to consider a hotel room. Unlike most nations around the world, there isn’t a huge marked difference between the cheapest hostels and a budget hotel room for the night. Hotel prices also start at £10 with plenty of options in the same range up to £19. Of course you could splash out on a luxury 4- or 5- star room if you’re happy to waste your travel budget. As the map shows, there’s a much wider distribution of hotels to choose from, and not restricted to a certain district. 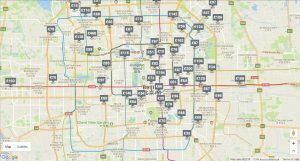 Worst comes to worst, air bnb is also available and done throughout Beijing. Side note: if you chose to stay in a hotel, be prepared to be offered some extra services via the hotel e.g. prostitutes. Its a very common occurrence that hotels will offer this service. Some are even said to have brothels in the basements. Such a renound city with inhabitants from all walks of life and every culture under the sun has succeeded in influencing Beijing, for better or for worse. With increased development comes the increase need of extracurricular entertainment. Particularly considering how hard the Chinese work, they need a suitably sufficient way of letting off steam. As a result you have the choice of everything from spa’s (both legitimate and semi-brothels), to clubs, high-end dining, bars and parks one would expect from any decent capital. When riding through the never-ending streets of Beijing, the single word of English you’re likely to find advertised along every store-front is the word “SPA“. This is an enormous industry in Beijing, used just as much by foreigners as do the locals. You’ll be handed a undecipherable menu of every relaxation technique known to man. As the Chinese tend to work themselves half to death, its no wonder that such an activity has become so popular. As a travel, be aware that some of these will be your legitimate health spas where you could take your own sainted grandmother. Where some others are essentially brothels, your good old-fashioned rub-n-tug. These spa’s offer alternative therapies, such as a 4-handed bath/body-to-body massage…I’m told. There’s so much demand for these spa’s (even the legitimate ones) that they’re open until the early hours of the morning. As with everywhere else, there’s two different drinking options: Pub or Club. An important decision when it comes to Beijing. Namely as one option will end up with you getting a free night. For the majority of clubs around Beijing, foreigners are a valuable commodity. A commodity clubs are willing to dish out freebies just to get. Full bottles of Grey Goose and Hennessey brought one after the other all night long for a total of £0. Why? To sum up: Foreigners = pretty Chinese young adults = fat ugly rich Chinese. Alternatively you could go to a bar, and pay an increase to Western prices for the few recognisable brands available. Be it a foreign bar or a local one, there are plenty options to chose from. For nature lovers and otherwise (a few days of Beijing’s smog will make you crave it), Beijing does have its fair share of parks that aims to counter-act the overflow of concrete. Beijing’s parks follow the city’s theme of bigger is better. It becomes easy to lose the chaos of the streets and allows for a moment of peace and tranquillity. 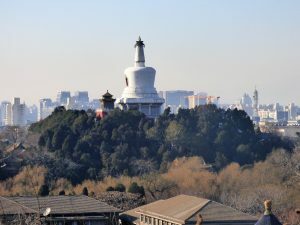 The most notable of which would be Beihai Park and Jingshan Park, or even the specially designed Olympic Park. If you ate at one place everyday in Beijing, it would take you years to cross them all off. There are food options all the way from the fanciest 5-star restaurants to the local merchant selling side-street made food. Just like any other city in the world, you have two options: restaurants and local side-street sellers. Beijing boasts more than enough high-end restaurants for the high-rollers that call this city home. Obviously expect to pay similar (if not more expensive) prices to those in the West. An odd difference from the West though is that quite a few of these fancy restaurants are in Asia’s mini town centres; malls. 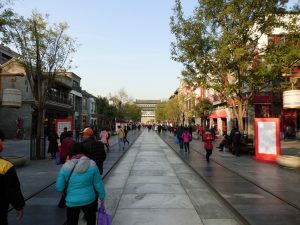 Beijing has a close relationship with malls, as they’re located everywhere and hold everything a potential customer might need. This includes the most expensive restaurants. So expect to walk up a couple of floors passed your adidas, apple and Ann summers stores along with their customers. The other more highly recommended option would be your side-street sellers. Although Beijing sadly doesn’t have much of your authentic merchant selling a single product from behind his cart. However local tastes can be found down the authentic hutongs and scattered amongst the modern shopfront. Plastic chairs are always a good sign. Much cheaper option despite being quite expensive for Asian standards. Some of Beijing’s highlight cuisine includes none other than Peking Roast Duck, which some restaurants will take very seriously, provided for a serious price. Another would include mutton hot pot; where a pan of sauce is boiled at your table for you to put in the various little items on a stick yourself.